Ignoring the American-hating bigot in the WH who should resign, maybe you should resign. As first reported by the Virginian-Pilot, Northam’s yearbook includes a photo of a man in blackface standing next to a man in a white Ku Klux Klan hood. Northam admitted he was one of the men, but did not say if he was the Klansman or the man in blackface, in a statement of apology. If Northam resigns he will be replaced by lieutenant governor Justin Fairfax, who is black. That being the case, I'm certainly open to putting Northam's resignation on the table. Good going to see a DEMs poster calling him out on it. Hold on. Who is defending King? The Republicans went as far as the minority party can in stripping him of committee appointments. 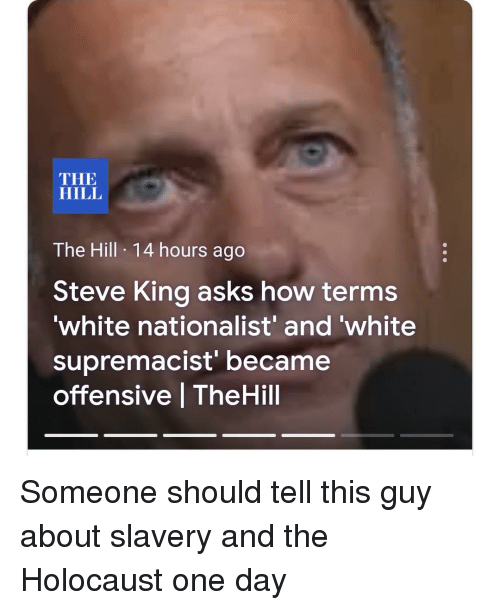 A bill condemning hate speech mentioning the congressman was passed by voice vote and the House majority leaders are not willing to take up censuring King at this time because of Democrats that walk the Anti-Semitic tight rope. Watch, King will get primaried in 2020. I denounce any talk of supremacy based upon identity. We are not the same but our differences are based upon individual human action stemming from merit and good deeds, this never extends beyond the individual. Nationalism is simply an isolationist scheme to attempt to make statist policies viable. Do you think if you look at large societies rather than individuals that you can note any real differences? I reject any talk of supremacy as well, but then there is also reality. The most troubled, impoverished, crime-ridden and overpopulated areas on earth all have a high % of people with low IQs. That's not the end-all of being a human, but in great numbers in modern times it is a recipe for being a 3rd world country. I believe as an economic reality that a 1st world country can wreck its economy and culture by over-importing from the 3rd world and doing so on a basis that doesn't choose by merit. And by merit I mean the people moving need to show they possess skills that will play in a 1st world economy, and that they want to integrate. So I reject your last statement, at least in that I read in it support for a Soros-level movement of people. Do you believe migration is a human right? How far are you taking "isolationism"? Where are the calls for the American-hating bigot, KKK Donnie, in the WH to resign? you support a racist in blackface and a pro infanticide governor.... why? Not good. No ifs ands or buts. He should resign. Lauren, Dem or GOP he needs to go. Disgusting stomach churning photo. Add to the fact he won't admit which one he is ?They are both equally bad. .And I am white.